It happens that even the most beautiful and expensive roses wilt within an hour or two after purchase. If you want to have flowers delight you with its freshnessYu, beauty and fragrance more than one day, you'll learn how to choose the right. To determine the freshness of roses by Bud, squeezing it slightly just above the base. The density and elasticity of the Bud says about the freshness of the flower, and the softness and lightness — of old age. If the edges of the leaves were wrapped up and darkened, then rose cut in a long time. Note the small leaves under the Bud (sepals). If they are hanging down, rose has repeatedly tried to refresh, pulling out the old petals. Attachment of the Bud to the stem must be very dense. Look at the stem and leaves. They should be bright green in color, without dark patches and damage. Limp, lifeless, dry leaves give out a stale flower. Do not take the rose, on the stem where the leaves are broken. Look in the tank where there are flowers. Dark water floating in it leaves says that roses are not the first day. Take rose, turn it over and shake a little. The old petals will not stand the test and goes off. If you see small bugs that fell from the Bud, — rose pest insects. Such manipulation with a flower better to do over a sheet of white paper, but since the store is almost impossible, it is a glass showcase. Sellers of flowers used many stratagems to preserve the freshness of roses and presentable. Do not buy flowers, buds which are linked by a rubber band. And give preference to flowers that have not yet been collected in bouquets. Shine and Polish on the petals can cause to disguise the staleness of colors. Buy flowers in specialized flower shops, and not from sellers on the street. In the halls more conditions for proper storage of flowers. Do not pay attention to the cut stem. Fresh and clean cut does not mean that the flower itself is cut recently. 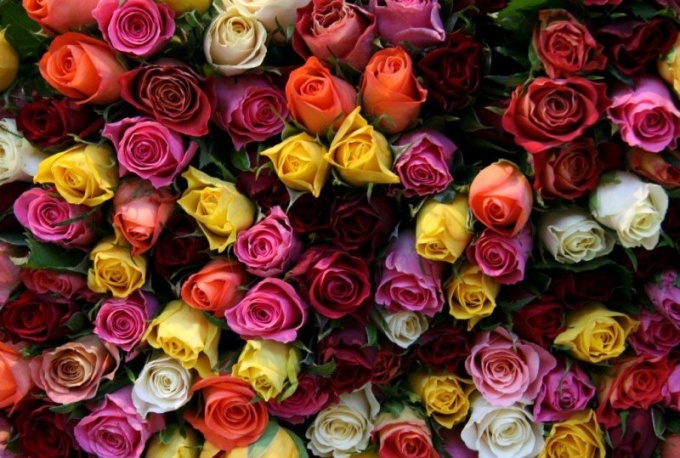 Do not buy roses with very open Bud — these flowers will delight you for long.